Yoshikazu Kato 1991 18 72 7179 45 minutes from Patong Beach. The Blue Canyon Country Club Canyon Course in Phuket leaped to worldwide fame when it was selected to host the 1994 Johnnie Walker Classic and since then it has been recognized as one of Asia’s top class Championship golf courses. The Blue Canyon Country Club Course features a waste of natural hazards, rolling fairways, often narrow landing areas and many well-guarded greens. 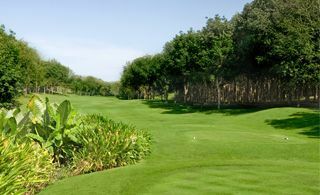 As its name suggests the holes are built along the canyon edges with undulating fairways and greens. The course has a challenging mix of narrow fairways requiring accurate tee shots and a number of dog-legs demand precise shots. Hole 13, ‘The Tiger Hole’ after Tiger Woods’ one-on shot across 270 yards past the great canyon from the black tee to the green is the hole of legends. Hole 17, the longest par-3 in Thailand, will still occasionally allow for a hole-in-one. The clubhouse meets all the expectations of the golf course with an excellent restaurant, outstanding Pro Shop and overall five star facilities.